The letter "Washboard and Fluted Terrains on Pluto as Evidence for Ancient Glaciation" focuses on these distinctive landscapes that border the vast nitrogen ice plains of Sputnik Planitia along its northwest margin (Figure 1), and which are amongst the most enigmatic landforms yet seen on Pluto. These terrains consist of parallel to sub-parallel ridges that display a remarkably consistent ENE-WSW orientation, a configuration that does not readily point to a simple analogous terrestrial or planetary process or landform. The aim of Dr. White's research is to use mapping and analysis of the morphometry (the process of measuring the external shape and dimensions of landforms) and distribution of the ridges to determine their origin and to understand their significance within the overall geologic history of Pluto. The work used imaging data returned by NASA's New Horizons spacecraft, which flew past Pluto in 2015, as well as topographic maps generated from this data. Washboard and fluted ridges are defined primarily by their topographic context: washboard ridges occur in level settings within valley floors, basins and uplands, whereas fluted ridges are seen on steeper spurs, massifs (or compact group of mountains) and crater walls that separate basins and valleys. The washboard and fluted terrain is seen up close in Figure 2, in which illumination is from the top. They occur at the location on Sputnik Planitia's perimeter where elevations and slopes leading into the surrounding uplands are lowest, and also where a major tectonic system coincides with the edge of Sputnik Planitia. 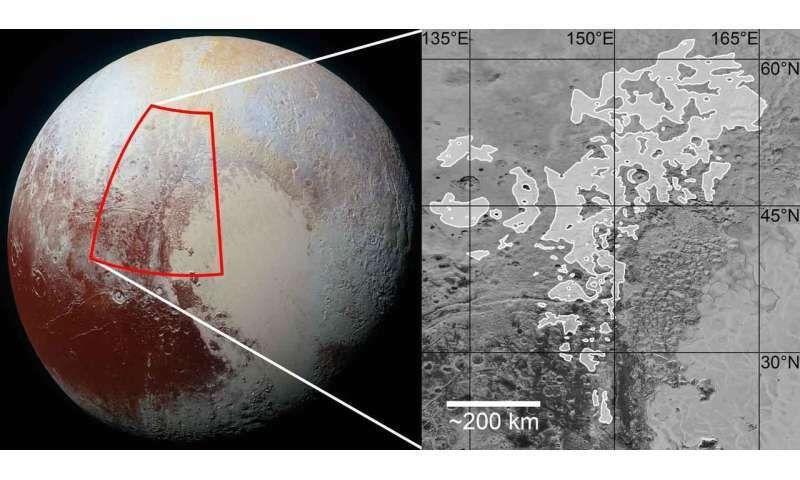 The low elevation of the area makes it a natural setting for past coverage by nitrogen ice glaciers, as indicated by modeling of volatile behavior on Pluto performed by Dr. Bertrand at Ames. 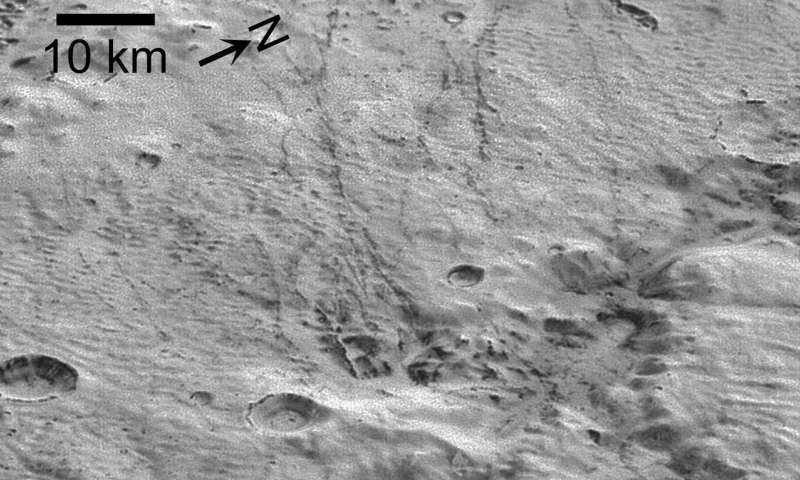 Through comparison of the washboard and fluted texture with parallel chains of elongated sublimation pits (depressions in the surface formed where ice turns directly into a gas) seen in southern Sputnik Planitia, the ridges are interpreted to represent water ice debris liberated by tectonism of underlying crust. This water ice debris was buoyant in the denser, pitted glacial nitrogen ice that is interpreted to have formerly covered this area, and collected on the floors of the elongated pits. After the nitrogen ice receded via sublimation, the debris was left as the aligned ridges, mimicking the sublimation texture – washboard ridges where deposited on flat terrain, and fluted ridges where deposited on steeper slopes. Crater surface age estimates indicate that the washboard and fluted ridges were deposited early in Pluto's history, after formation of the Sputnik basin by a giant impact ~4 billion years ago. Acting as a giant cold trap, it was to this basin that surface nitrogen ice across Pluto migrated over some tens of millions of years, thereby causing the recession of nitrogen glaciers from upland areas such as that now occupied by the washboard and fluted terrain. The precise mechanism that elongated the sublimation pits and defined their strikingly consistent orientation regardless of latitude or location relative to Sputnik Planitia is elusive, but is consistent with a global-scale process. A constraint is that true polar wander solutions for Pluto (provided by co-author Dr. James Keane of Caltech) indicate that the ridges can never have all been oriented N-S at any time in Pluto's history. This suggests a cause for the alignment that is not exogenic (i.e. the orientation is likely not governed solely by solar illumination, which would cause all the sublimation pits to align N-S). Dr. White summarizes the findings as follows: "These terrains constitute an entirely new category of glacial landform that is unique to Pluto, and represent geological evidence that nitrogen ice glaciation was more widespread across Pluto in its early history prior to the formation of the Sputnik basin. The dense spacing of the ridges allows us to precisely map out the past coverage of the glaciation that deposited them, which extended across at least 70,000 km2 of Pluto's uplands (larger than the state of West Virginia)". Wow, all those big words used to disguise the fact that Pluto represents a significant problem for the nebular theory of planet formation! It just refuses point blank to play along with what the priests of that theory propagates as fact. Pluto's low gravity (about 7% of Earth's), coupled with heating by ultraviolet light from the sun, allows hundreds of tonnes of Pluto's atmospheric nitrogen to escape into space each hour. So how, after the alleged billions of years, does it still have an atmosphere of mostly nitrogen? Where does the geological power come from that supposedly replenishes the nitrogen? Pluto is so small it's supposed to be cold stone dead after 4 billion years of existence. Enigmatic, very enigmatic, to say the least. 1. Pluto orbits at 17 degrees to the ecliptic - inexplicable, except by the old canard of being hit by some other object. 2. Pluto's axis of rotation has one pole pointing almost at the sun, not near perpendicular to its orbit. 3. Pluto's orbit is extremely elliptical - so much that many times it's closer to the sun than Neptune. 4. Pluto's moons all rotate at different speeds and Nix is retrograde. 5. The clear evidence of ongoing geological activity on Pluto AND its moons indicate a very young age, definitely NOT billions of years as claimed by the nebulous theory - pun intended. Wow, all these big words used to confirm the fact that FredJose represents significant proof for the nebular theory of idea formation! Now that's interesting. It must have been a moon sometime. No other way to get the heat.